On Saturday, St. Bartholomew’s United Church is hosting a fundraiser to help provide equipment for an all-abilities playground in West Manheim Recreation Park. Lonnie and Christine Gienski, of the West Manheim Park and Recreation Board, are working with the York Adams Community Tennis Association, to organize the fundraiser — a German dinner — now in its eighth year. The board initially worked with Hailey’s Wish Foundation, an organization that aimed to create an all-abilities playground for Manchester, Maryland teen, Hailey Miller, who was born with cerebral palsy. After the playground was built last November, the West Manheim Park and Recreation Board continued raising funds to bring one to Pennsylvania. The project has raised $50,000 from the annual fundraiser, as well as events during the year, including a 5k run, the Bark for Life event featuring cancer survivors and their pets, and an Easter egg hunt for kids and dogs. Each year, about 150 students, scouts and parents from the community come together to volunteer for events and work in the park. All funds are maintained by West Manheim Township. The playground, which will include special ramps, a group wheelchair swing, touch-and-feel toys for autistic kids, teeter-totters with wheelchair access, and a rubberized mat which aids in access to the playground itself, is geared toward children with and without disabilities. The Gienskis emphasize the importance of allowing access for all abilities to play together as part of a group. A public playground is a government entity, which requires adherence to safety rules, engineering fees, and permits from the county and state. The metal has to be a certain strength, and the wood has to be a certain thickness, she said, which drives up costs and makes items more difficult to acquire. 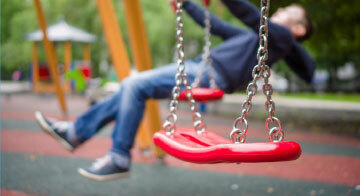 A few swings could cost up to $70,000 in engineering fees, according to Christine Gienski. But the minimum could be done for $50-70,000, and they hope to get started, with the idea of adding more pieces over time. The project also receives money from housing recreation fees — for every new house in the township, $1,200 goes into the park recreation fund — and Christine and Lonnie Gienski are hoping to see that money within the next year. “(West Manheim Township) just got approval for a very large community that could push us past the point to put the park together,” Lonnie Gienski said. The community can support the project through this Saturday’s German dinner at St. Bartholomew’s United Church. German specialties such as pork schnitzel — a boneless pork loin top tenderized, breaded, and hand fried — will be homemade the day of the event, and a live oompah (polka) band will perform in authentic German costumes. “It’s very cool because the dinner attendees get up and dance,” Christine Gienski said.